WASHINGTON, DC, March 12, 2013 (ENS) – Ancient Mars could have supported living microbes in a wet environment, NASA scientists have concluded based on analysis of a rock sample collected by NASA’s Curiosity rover. The data indicate that the Yellowknife Bay area the rover is exploring was the end of an ancient river system or an intermittently wet lake bed that could have provided chemical energy and other favorable conditions for microbes. The Curiosity rover landed on Mars in August 2012, the fourth rover the United States has landed on the Red Planet. Last month, Curiosity used a drill carried at the end of its robotic arm to bore into a flat, veiny rock on Mars and collect a sample from its interior. 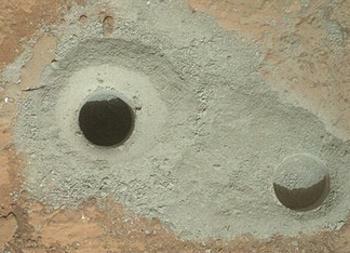 It was the first time any robot has drilled into a rock to collect a sample on Mars. Curiosity drilled into a sedimentary rock near an ancient stream bed in the Yellowknife Bay area of the Gale Crater. In the powder from the drill sample, scientists have identified sulfur, nitrogen, hydrogen, oxygen, phosphorus and carbon – some of the key chemical ingredients for life. These fine-grained sediments, likely deposited under water, indicate that Mars could have supported ancient microbial life. Data gathered by Curiosity indicate a habitable environment characterized by neutral pH, chemical gradients that would have created energy for microbes, and a distinctly low salinity, which would have helped metabolism if microorganisms had ever been present. “Clay minerals make up at least 20 percent of the composition of this sample,” said David Blake, principal investigator for the CheMin instrument at NASA’s Ames Research Center in Moffett Field, California. Scientists were surprised to find a mixture of oxidized, less-oxidized, and even non-oxidized chemicals, providing an energy gradient of the sort many microbes on Earth exploit to live. This partial oxidation was first hinted at when the drill cuttings were revealed to be gray rather than red. Red, like rust, is a sign of oxidation. “The range of chemical ingredients we have identified in the sample is impressive, and it suggests pairings such as sulfates and sulfides that indicate a possible chemical energy source for micro-organisms,” said Paul Mahaffy, principal investigator of the Sample Analysis at Mars, or SAM, suite of instruments at NASA’s Goddard Space Flight Center in Greenbelt, Maryland. Data returned by the rover’s SAM and Chemistry and Mineralogy instruments show that the rock is made up of a fine-grained mudstone containing clay minerals, sulfate minerals and other chemicals. This ancient wet environment, unlike some others on Mars, was not harshly oxidizing, acidic or extremely salty. “We have characterized a very ancient, but strangely new ‘gray Mars’ where conditions once were favorable for life,” said John Grotzinger, Mars Science Laboratory project scientist at the California Institute of Technology in Pasadena, California. “Curiosity is on a mission of discovery and exploration, and as a team we feel there are many more exciting discoveries ahead of us in the months and years to come,” said Grotzinger. Scientists plan to work with Curiosity in the Yellowknife Bay area for several weeks before beginning a long drive to Gale Crater’s central mound, Mount Sharp. They say that investigating the stack of layers exposed on Mount Sharp, where clay minerals and sulfate minerals have been identified from orbit, may add information about the duration and diversity of habitable conditions. NASA has sent four robots to explore Mars. Sojourner rover, Mars Pathfinder, landed successfully on July 4, 1997. Communications were lost on September 27, 1997. Spirit (MER-A), Mars Exploration Rover, launched on June 10, 2003 and landed successfully on January 4, 2004. Nearly six years after the original mission limit, Spirit had covered a total distance of 7.73 km (4.80 miles) but its wheels became trapped in sand. Around January 26, 2010, NASA conceded defeat in its efforts to free the rover and stated that it would now function as a stationary science platform. The last communication received from the rover was on March 22, 2010, and NASA ceased attempts to re-establish communication on May 25, 2011. Opportunity (MER-B), Mars Exploration Rover, launched on July 7, 2003 and landed successfully on January 25, 2004. To date, Opportunity is still operating, having surpassed the previous record for longevity of a surface mission to Mars on May 20, 2010. Curiosity, Mars Science Laboratory, by NASA, was launched November 26, 2011 and landed in the Aeolis Palus plain near Aeolis Mons, called informally Mount Sharp in Gale Crater, on August 6, 2012. 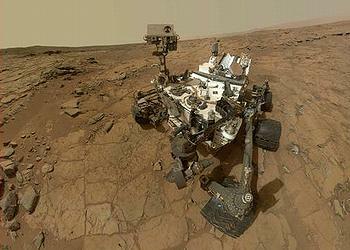 Curiosity Rover is still going.